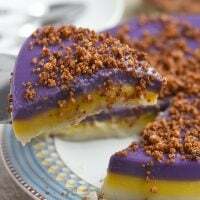 Out of the long and varied list of Filipino sweets and delicacies, I have to say, nilupak leads as my all-time favorite. 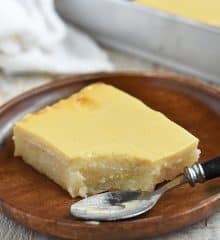 For a midday treat, I regularly enjoy the soft bites of mashed cassava and grated coconut pulled together by sweetened condensed milk and a generous slathering of margarine. But not only is this popular Filipino snack addictingly delicious, it is also pretty uncomplicated to make. Aside from minimal physical effort from the pounding of boiled root crop, this nilupak recipe is simple enough to have ready in no time. In a pot over medium heat, combine cassava, salt and enough water to cover. Bring to a boil and cook, uncovered, for about 15 to 20 minutes or until very tender. Drain from liquid and allow to cool. Remove the tough, stringy core and discard. With a mortar and pestle or in a food processor, mash boiled cassava to desired consistency (I like my nilupak with some bits and pieces for texture but you can process the cassava until smooth). 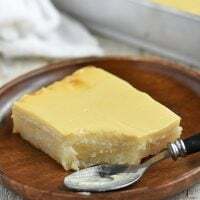 In a wide pan over low heat, combine cassava, condensed milk and margarine. Cook, stirring regularly, until thickened and mixture begins to pull from sides of pan. Spoon mixture onto banana leaves, smoothing surface and sides with back of a spoon. Top with margarine and coconut. Hi Ms. Lalaine.. Can I ask a question? Hi Lalaine! 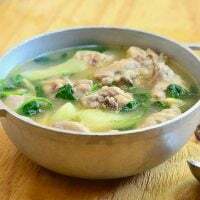 I’m ilonggo and this is an ilonggo delicacy. My mom would make this when I was a kid…except she would also mix nilagang saging (boiled cooking banana or “Tundal” in ilonggo), and mash it with the cassava. More cassava to banana ratio. Also, instead of using mature grated coconut, she used strings of young coconut. Big difference in taste! Loved it! Thank you for sharing this! 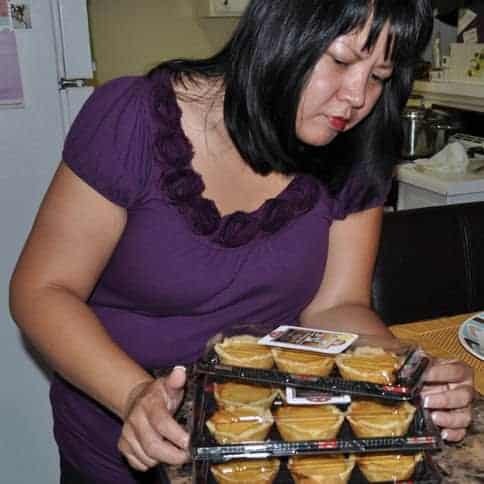 Thanks for sharing your mom’s recipe. I can’t wait to try it, sounds amazing! Will the grated coconut be mixed with mashed cassava? Hi Lalaine. im just wondering where did the grated coconut go? it is listed ik the ingredents but you didnt put in its use in the instructions. Hi, Lalaine. 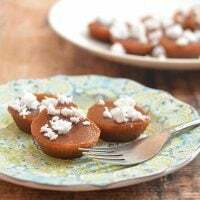 I have not tried making Nilupak and this looks delicious! I would like to know if I can use butter instead of margarine? And if using margarine, is Star Margarine fine? 🙂 Thanks a lot. This look really delicious. I remember eating this in the Philippines and I loved it, but I did not know how to make it. Thanks for the recipe. It was here already in the US I discovered and had my first taste of Nilupak. Funny, I never had it in the Philippines. It is really very simple to make, hope you enjoy it. Thank you and good luck to the group.Merry x mas and Happy new year to one and all….best regards.